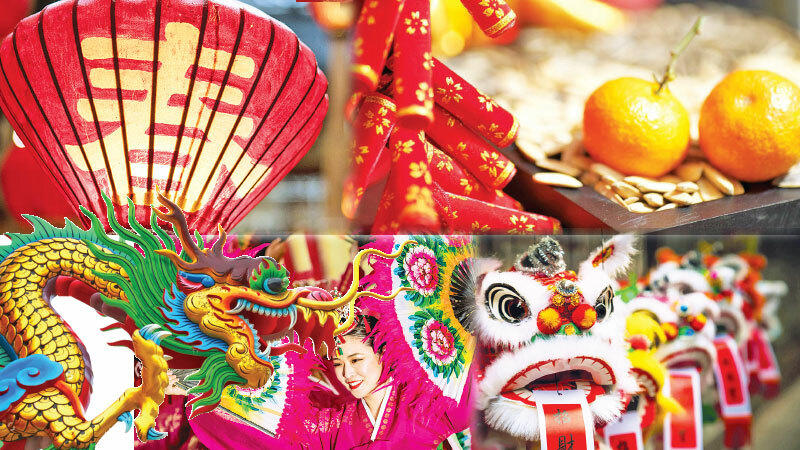 For over 4,000 years, Chinese New Year has been lighting up the world with vivid colours, mouthwatering dishes, and ancient customs that keep history alive and well. It’s celebrated all over the world by people from all walks of life, with its central core reverberating from Southeast Asia. The date for Chinese New Year changes each year. It always falls between January 21 and February 20, determined by the Chinese lunar calendar. Chinese New Year 2019 was on February 5. Though in winter, Chinese call their New Year holidays 'Spring Festival', because 'Start of Spring' (February 4 to 18) is the first of the terms in the traditional solar calendar. While wintry weather prevails, 'Start of Spring' marks the end of the coldest part of winter, when the Chinese traditionally could look forward to the beginning of spring. There are 12 Chinese zodiac animals. The 12 animals are: Rat, Ox, Tiger, Rabbit, Dragon, Snake, Horse, Goat, Monkey, Rooster, Dog and Pig. 2019 is a year of the Pig. Traditionally, the 16 days from New Year's Eve until the Lantern Festival each had a special celebration activity. In the evening of 15th day of the first lunar month (February 19, 2019), on the night of the full moon, families gather for dinner and go out and see fireworks and light lanterns. Lanterns are put up for decoration, let loose to fly, and floated in rivers. Chinese people love the colour red. Giving red envelopes is a way to send good wishes and luck (as well as money). Red envelopes are given out from older to younger, from bosses to employees, and from leaders to underlings. It is a special New Year's bonus. The world’s population will be 7.7 billion for Spring Festival 2019, and over two billion celebrate it in some way, even if it’s just a national acknowledgement. For Chinese people, the most important part of the Chinese Spring Festival is to enjoy a reunion dinner with their families on New Year's Eve, even if they have to travel long distances. 200 million Mainland Chinese travel long distances for these holidays, and it is estimated that there are 3.5 billion journeys in China. Tens of millions of people travel in other countries too. During the Chinese New Year period, there are many superstitions. Washing hair or clothes is not allowed on the first day of the lunar year because it is seen as “washing one’s fortune away” at the beginning of the year. Sweeping up and taking out the garbage symbolize removing the good luck from the house, so people don’t do that either. No single hour in any other country sees as many tons of fireworks lighted as in China around the midnight beginning Chinese New Year. China produces about 90 percent of the world's fireworks! This is a fresh-new fact about Chinese New Year. Chinese New Year is a joyful time for most, but for singles above the normal matrimonial age it's not. In China, females are said to be marriageable up to 30, and males before 32. For “old” singles, parents are extremely anxious. So New Year's Eve stress is heightened by embarrassing interrogations of the singles. Desperate parents even arrange dating (prospective marriages) for their single children.